known as "the first mestizos". Chetumal border with Guatemala and Belize, is also the gateway to Central America, where the Rio Hondo, the natural border between Mexico and Belize. 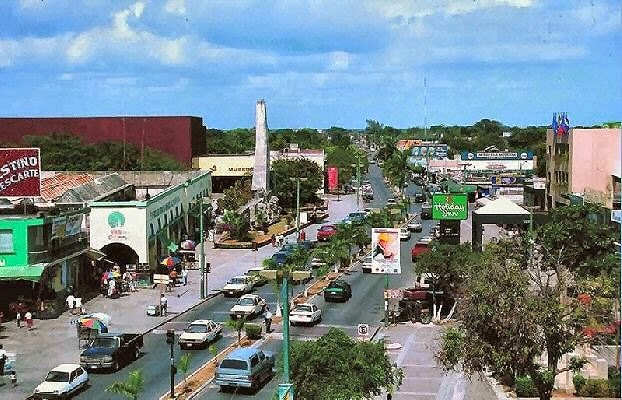 This city, with give a real Caribbean style, is at the forefront in the development and care of the ecology and protected areas and its great relevance, Chetumal Bay and its coastal portion is one of the top six of the 21 areas protected status, not only for being part of the Mesoamerican Barrier Reef System, but because habitat, breeding area, food and shelter for many species of birds, terrestrial and marine fauna, especially the manatee. That is why this area was declared protected area in 1996 Natural State "Santuario del Manati, Bahia de Chetumal." As the state capital, is a city with lots of activity, however, Chetumal also offers its visitors natural beauty, tourist attractions, cultural and historical, invite you to experience this growing city and its surroundings, providing a wide range of daytime activities, day trips, evening entertainment, ecotourism, sport fishing, diving, delicious dining and an encounter with nature, a paradise filled with history, culture and folklore. A relaxing and peaceful walk in the boulevard, which surrounds the bay, it is also a pleasure to behold from shore as blue and green hues that characterize the beatiful Caribbean Sea, while contemplated appreciate most of the sculptures sculptural Chactemal Corridor. In the city, you may visit its museums such as the Cultural Center of Fine Arts, the Cultural Rafael E. Melgar Polyforum, the Museum of Mayan Culture, the City Museum, the Palace of Government, its various monuments and parks, including the Zoological Park of Payo Obispo. Another attraction of the city is the Model of Payo Obispo, which recreates a scale of 1:25, the old village. This model, which can be seen on all four sides from a peripheral walker, was created by Luis Reinhardt McLiberty, supported by researchers, and craftsmen and has 185 wooden houses, 150 people, 16 wagons, 100 pots, 83 plants of banana and 35 trees chit. Also important archeological sites can be visited, for their proximity. Oxtankah. It is located 16 kilometers north of Chetumal. Kohunlich. This ceremonial center and Mayan city is approximately 65 km away from Chetumal, in the Rio Bec region, also near the border with Belize. Chakanbakan. This archaeological site is located 93 km from Chetumal, on the road to Escorcega. Chacchoban. It is located in the town of the same name, 70 km from Chetumal. Tamalcab Island. This uninhabited island is located in the Bay of Chetumal and is reached by boat. This ideal place to relax, practice snorkeling and diving for its calm waters and shallow pools, which are the habitat of a variety of marine life. On site there are some archaeological remains. Calderitas, located just 8 km from Chetumal, small port. This picturesque fishing village famous for the delicious dishes made ​​with fresh seafood and for being a great place to cool off in the spa waters. Dos Hermanos. You come to these two islands by boat, departing from Calderitas. This town is ideal for bird lovers, as it has an observatory where you can admire a lot of birds. Laguna Xul-Ha. It is located on the banks of Laguna Bacalar, just 5km 22km Bacalar and Chetumal. The turquoise blue color of its waters are really impressive. El Palmar. A 32 km from Chetumal, Alvaro Obregon, is a spa with a spring, where they can be savored dishes based on seafood and fresh fish. The gastronomy in Chetumal has been exposed to many influences, both from Caribbean Belize, and Mexico and other states of Chiapas, but without a doubt, is stronger the influence of the Yucatan Peninsula. Condiments called "errands" are the basis for the preparation of many recipes, like the use of bitter orange. Several delicious typical dishes of the region, such as: cheese filling, fish Pil-Pil, chigua fried chicken marinated with red message, queen or sotobichay arm, cazon bread, fish tikinxic the Caribbean rice beans (rice and beans), tamales xpelon and delicious desserts made with typical ciricote, nancen or nanche and other fruits of the region.